Wife: You have to come home. Wife: I mowed the grass. Me: Ahhhh, I see. Wait, how did mowing the grass almost kill you? Wife: Weeeeeeell, you know the swing set? I put one of the swings up out of the way, and the other one... not so much. Me: I don't see how a swing almost killed you while you were mowing the grass. Wife: Weeeeeeeell, you see, I drove into it. Me: Uh-huh. You mean you crashed into the swing set? Wife: Weeeeeeeell, no. I drove into the swing. Me: I'm sorry, I mustn't have had enough coffee. How do you drive a 56" deck, 500 pound lawn tractor... INTO a swing? 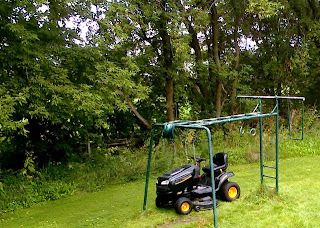 Wife: I was too lazy to stop the tractor, and move the swing out of the way. So when I drove though, the swing got caught on the edge of the tractor and flipped it over! Me: You... rolled the tractor? Me: Did it land on top of you? Wife: Yes! It almost pinned me! And the blades were coming at me! I had to kick the lawn tractor away from me... otherwise... I would be DEAD! Wife: I'm sore from falling off the tractor. Me: Okay, well, I'm on my way home. Wife: Okay. Oh, and make some supper when you get home... because I almost DIED! Wife: And bring me some Sticky Toffee cake! Me: You want stick toffee cake? Me: Alright, I'll get you some cake. Wife: And a back rub. Me: You need a back rub?! Me: Sure. I'll give you a back rub. Wife: Good. Cuz I almost died you know. Me: Uh? Wha? Nothing. Hmmmm... I gotta go. So, I know you might be wondering, how my wife almost killing herself relates to us adopting. I think there is a distinct pattern of poor judgement there. I figured, we SHOULD NOT bring another person into this world who was built from the same DNA as my beautiful wife. Okay, I just about DIED laughing. ;) Just don't make me fess up to my own list of calamities. This is so me. If there is way for me to injure myself, I somehow find it. Broken ribs, third degree burns, car accidents, sprains and concussions - I've managed to do it all. I think your wife and I would very much get along. We are seriously cracking up at the Raudenbush house over this one. We have been waiting on the edge of our seats for this post after your wife announced the near death experience on the forum. Roberta...STAY AWAY FROM THE SWINGS! too funny...and how was the cake? Phew! My name wasn't mentioned! 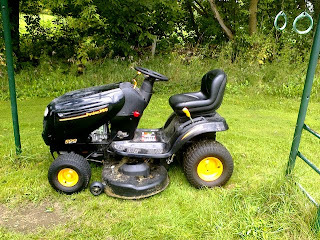 OK... this lawn mower story is just about the funniest thing... EVER! I mean, really those lawn mowers should have a safety warning! Dangerous stuff! Nancy: I would have to take a guess that my wife was visiting your site from ours... she reads alot... A LOT of blogs. :-) Glad you found ours tho. WAGI *I THINK* stands for "We Are Grafted In". Its a community forum site (kinda like Rumor Queen)... I could be wrong on WAGI, my wife probably knows for sure tho. Not that anyone really needs to know... but 170$ later, and the mower is working again. A little rougher for wear and tear, dented hood, shaking deck, stalls when you floor it... but working. *siiigh* Love you babe!